Durga is the goddess we call for protection and help us move through obstacles. She is a fierce warrior and she is motherly. She is a queen and also a martial artist goddess that stands up for justice and inner freedom. She invites us to speak our truth and to stand up for it. 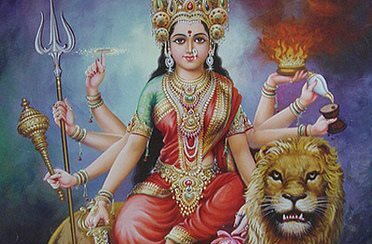 Durga is the female archetype for inner and outer power, she supports us to set clear boundaries by creating a protective field around us and she also gives us impulses to move forward. Durga embodies the protective energy of the mother-lioness, and that is how she comes to us when we call her: powerful and elegantly ridding on a lion or a tiger. And she invites each one of us to find our own power animal – to ride it and to receive its qualities of joyful strength and will. Durga represents the instinctual energy known in the animal world, which naturally protects her offsprings and care for the herd. She is the quality of strength and power in women, which flows from her belly into her solar plexus into her heart, arms, and hands… and she takes appropriate actions that are attuned with her body, her heart, and her environment. The Durga that is in all of us asks: “What do you need to say no to, in this moment of your life? What do you want to say yes to? How do you define your limits – at work, with a partner, in life? How much are you in contact with your body to sense and feel what you really want and need? How do you communicate that? We meet Durga when we dance and sing, when we feel ourselves in our strength and our vulnerability, and when we discover our limits in connection with our bodies. And with her support, we awaken the awareness of our female natural confidence and courage. http://www.komalaamorim.com/wp-content/uploads/2019/02/Durga.jpg 244 372 Komala Amorim http://www.komalaamorim.com/wp-content/uploads/2017/09/logo-300x138.png Komala Amorim2019-02-10 14:07:192019-02-10 14:15:37Durga - The Warrior Motherly Goddess. Lakshmi – The Golden Goddess of Love, Abundance and Generosity PARVATI – the goddess of relationship and sacred marriage.